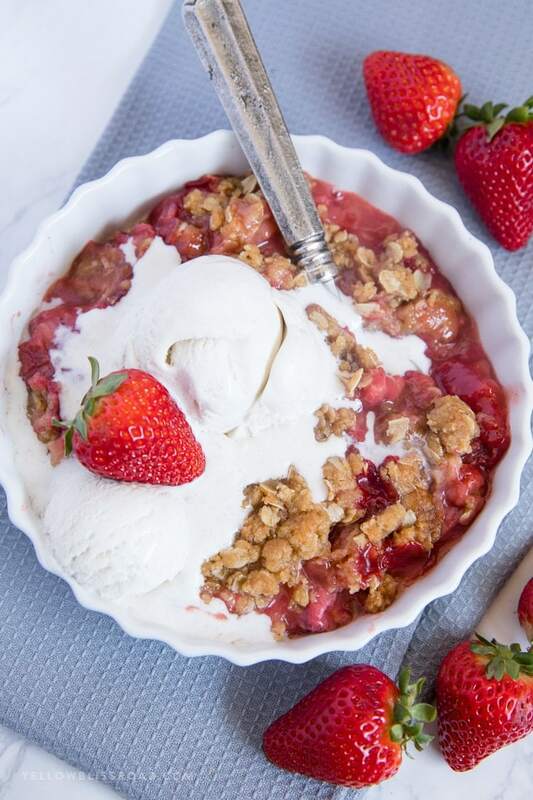 Strawberry Rhubarb Crisp is an easy fruit dessert made with fresh, sweet strawberries and tart rhubarb. It’s a refreshingly classic dessert that is perfect for warm spring and summer nights. 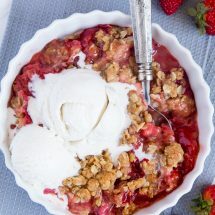 Fruit Crisps are one of the easiest non-chocolate desserts out there, and this Strawberry Rhubarb Crisp is a home run. Served warm out of the oven with a couple scoops of vanilla ice cream on top? Well that there is a grand slam! 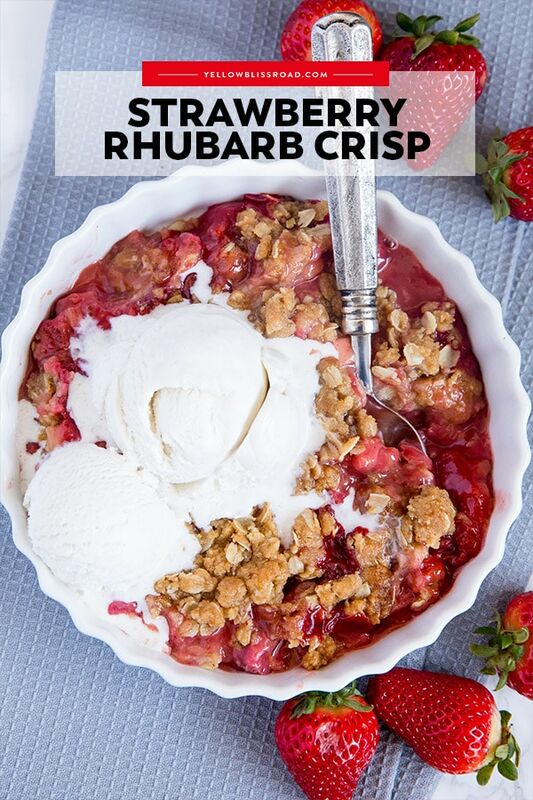 Have you ever tried rhubarb? I know some people (my husband included) are afraid of it, but it’s actually quite delicious when treated the right way. 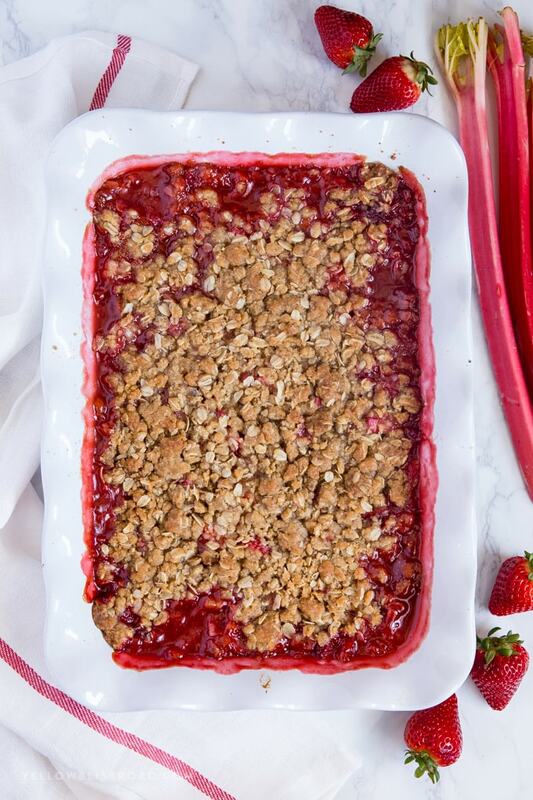 Strawberries and rhubarb are a classic combination of sweet and tart, making them best friends in this sweet fruit crisp recipe. 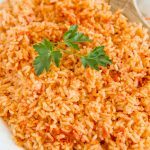 Before diving into the recipe, let’s learn some facts, shall we? Rhubarb is actually a vegetable, although when it is cooked down with a little sugar, it is actually quite sweet which is why rhubarb is often confused for a fruit. You will typically see it in desserts. On it’s own it’s quite sour. My mom actually remember my grandmother giving her and her brother raw rhubarb dipped in sugar as a tasty snack when they were kids! Rhubarb looks a bit like celery, but is bright red/pink in color. The texture is tough than celery, however, and the leaves cannot be eaten. S like to peel it a little before cooking, similar to how you would peel the strings from stalks of celery. 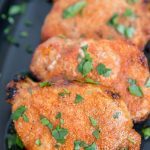 There are tons of health benefits in rhubarb as it is full of vitamins and minerals like Vitamin C and Potassium, which is why so many people search for rhubarb recipes! First, you’ll need to sugar the strawberries and rhubarb and soften them up, releases their juices. Pour all of the fruit into a bowl and sprinkle with sugar and cinnamon and stir together to coat well. Then pour that into a large baking dish. 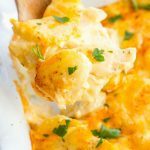 Now you have the base for your crisp! 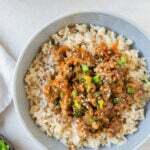 The topping is simply, flour, brown sugar, oats and nutmeg mixed together with some melted butter. This is sprinkled evenly over the top of the sugared fruit and when baked will become “crisp,” hence the name. That’s it! Bake in a 350 degree oven for about 40 minutes or until the top is golden and the fruit mixture is bubbly. This type of dessert does tend to spread out a bit when served, so I like to serve it in the lovely tart dishes (aff). They are like bowls but with a flat bottom and low sides! 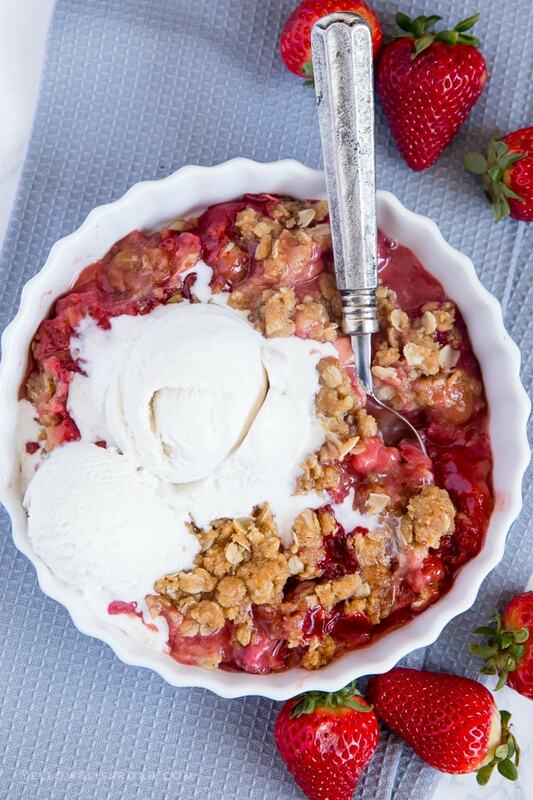 Of course this Strawberry Rhubarb Crisp is delicious on it’s own – sweet, tart, and totally refreshing. But it’s even better with a generous scoop of vanilla ice cream or fresh whipped cream on top! 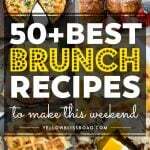 Want some more Strawberry recipes to try? 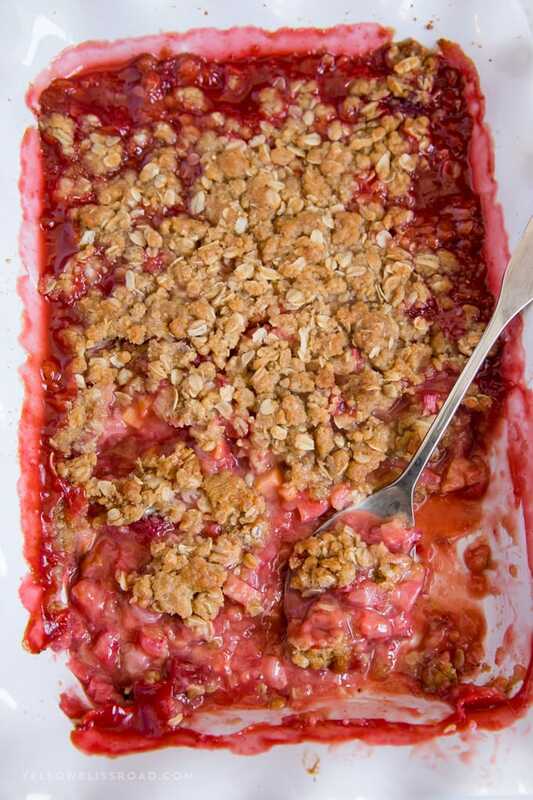 How about some more deliciously tart rhubarb recipes? 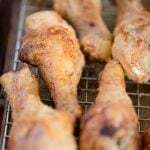 Preheat oven to 350 degrees F. Grease a 9x13-inch baking dish with nonstick cooking spray or butter. Set aside. In large bowl combine rhubarb, strawberries, sugar, 1/3 cup flour and cinnamon. Pour into a greased 9x13-inch baking dish. In another bowl combine 1 cup flour, brown sugar, oats and nutmeg. 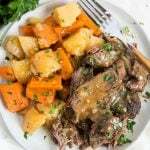 Stir in melted butter and blend well. Sprinkle oat mixture over the fruit mixture in the pan. Press down gently. Cool for at least 15 minutes before serving. 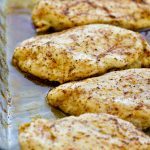 This crisp is delicious on it's own but even better with a scoop of vanilla ice cream!